The 27.43 metre catamaran motor yacht Pegasus IX has been listed for sale by 26 North Yachts. Built in aluminium by Australian yard Sabre Catamarans to ABS class, Pegasus IX was delivered in 2004 and most recently had a multi-million dollar refit in 2015. Accommodation is for six guests in three cabins comprising a full beam master suite and two VIP suites. All guest cabins are located on the main deck and come with television screens and en suite bathroom facilities while the crew quarters sleep three members of staff aboard this yacht for sale. The spacious saloon has a vaulted ceiling plus dining, a bar with four stools and relaxation areas along with an entertainment centre including a 55-inch Phillips flatscreen television. There are two large garages in the aft hulls that can be set up as dive centres, toy storage or fishing centres. The upper and lower deck spaces are comparable to a much larger yacht and she features huge outdoor areas that rival most 34 metre monohulls. Twin 1,900hp MTU diesel engines enable a cruising speed of 23 knots topping out at 26 knots. 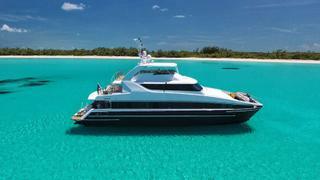 Lying in Nassau, the Bahamas, Pegasus IX is asking $2,995,000.